This half term we were lucky enough to take part in Forest School activities delivered to us by Rachel. For the first week we carried out a leaf hunt in pairs where we hunted high and low looking for the leaves pictured on the cards. We then used crayons and made rubbings of each leaf that we successfully found. We really enjoyed the second week. We were split into two groups and each took it in turns to make dens and jewellery. For the dens we used ropes, wooden pegs and big pieces of material. Before we could start the dens we all had to learn the half hitch knot. At first we found this tricky but we all persevered and all managed a knot in the end. We tied the knots to safely secure the rope to the trees. We made sure our dens were secure by using wooden pegs. We were all extra careful when using the hammer to get the pegs into the ground. When we weren’t making dens we got to make a bracelet or a necklace by using string and pieces of wood as beads. We had to use a small thin screw driver to make a hole in the wood so we could thread the string through. We loved wearing them in class to show them off to the other children. During our final week we all worked together to build a fire. We had to collect dry wood as this is the wood that burns the best. This was hard as it had rained a couple of days before. We luckily managed to collect enough wood for the fire. We used thicker logs to make a barrier for the outside of the fire to show where we could and could not walk. We all sat around the fire but made sure we sat safely on our knees and not too close. We were all given two marshmallows on a kebab stick and a chocolate digestive. In small groups we took it in turns to carefully toast our marshmallows. Some marshmallows were a little more well done (burnt) than others but they all tasted yummy. You could tell because we were all so quiet when eating them. We made a sandwich with the chocolate digestives and the marshmallows, these are called Smores. The Forest School fun carried on in the next term. During the first week we had to match leaves to their seeds. This was challenging so we used books to help us match the leaves to the pictures which helped us identify the seed. For the second half of the session we got into pairs and one of us wore a blind fold. We had to guide our partners to a tree where they had to hug it to find out its size and smell it to see if we could work out which tree it was. We then had to go back from where we started and see if we could guess which tree it was. We all managed to correctly identify our trees. We enjoyed the second week of Forest Schools when we got to make an arrow which we then threw at various targets to score points. We made the arrows by using thin twigs which we tied together using the half hitch knot which the first group also learnt. We found it easier to tie the knots when we were sat down and the sticks were between our knees. We used different techniques to throw the arrows and worked out which one was the best technique to use. Some of us managed to hit the 20 target every time. We also got to build a fire and enjoy smores on our final week. We collected logs to use as seats. We had to make sure that the logs were wide and small so they were comfortable to sit on. 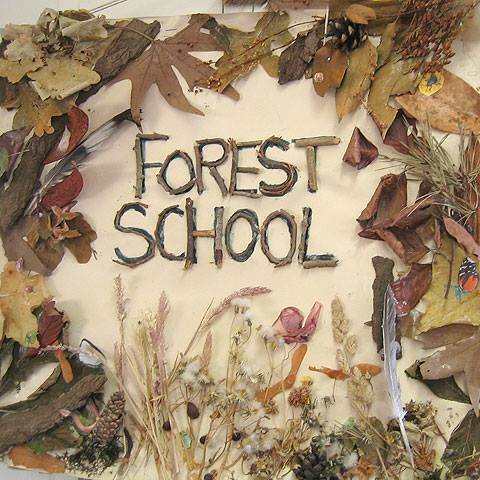 We are all looking forward to doing more Forest School fun activities with Rachel in the new year.